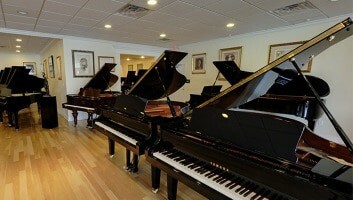 We are the region’s only authorized Yamaha piano dealer and carry the complete Yamaha piano line. The Yamaha piano is the unrivaled choice for pop and jazz musicians and is found on nearly all performance stages and recording studios. Classical pianists have also embraced the beauty of the new Yamaha sound. Yamaha pianos built at the Kakegawa factory, merging traditional techniques with technical perfection and advanced technology. Balancing leading technology and innovation with the timeless skills of expert artisans, Yamaha pianos have come to represent an unsurpassed standard of affordable excellence. It is a standard that continues to generate ever-higher acclaim and make Yamaha grand pianos the first choice of many of the world’s most discriminating pianists. 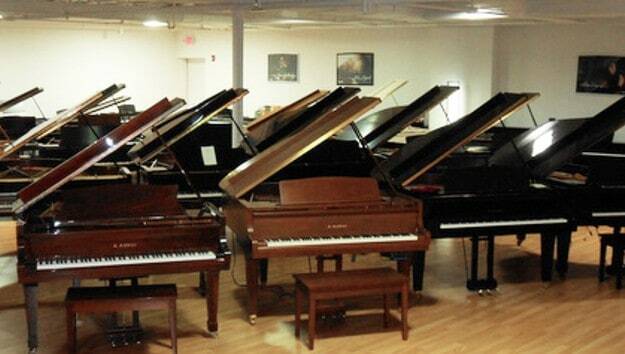 Yamaha boasts the most extensive piano product line in the world. Pianos include Clavinova digital pianos, the concert-level CX series, and the AvantGrand (the world’s first ‘hybrid’ piano). Yamaha prides itself in achieving exacting production standards and maintains a commitment to absolute quality. Yamaha has set the standard for quality among its peers. As the world’s largest piano manufacturer, Yamaha excels at producing pianos that are exceptionally consistent from instrument to instrument. By producing yamaha pianos at a mass scale, Yamaha’s “economies of scale” enable it to provide its pianos at quite affordable prices. 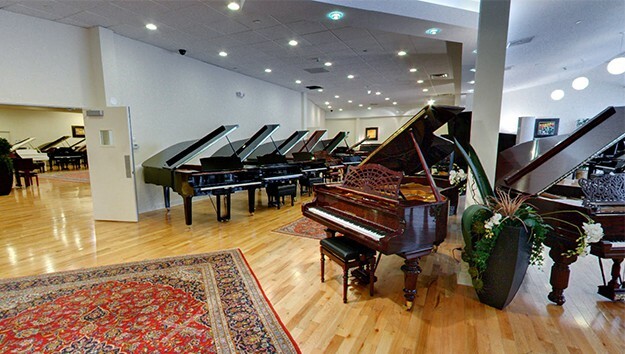 The region’s largest selection of high-quality, used Yamaha pianos, certified and guaranteed. 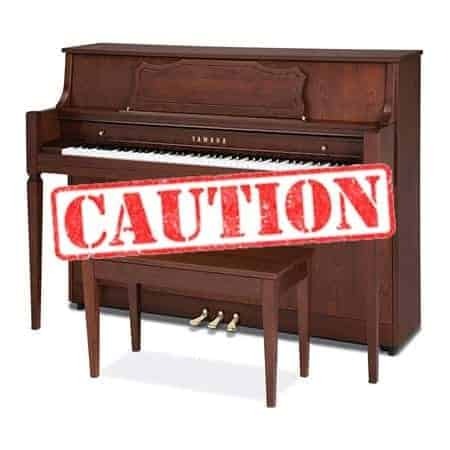 Avoid “Grey Market” used Yamaha pianos. The world’s largest and best known piano producer. Torakusu Yamaha, a watchmaker, developed Japan’s first reed organ, and founded Yamaha Reed Organ Manufacturing in 1887. In 1899, Yamaha visited the U.S. to learn how to build pianos. Within a couple of years he began making grand and vertical pianos under the name Nippon Gakki, Ltd. Beginning in the 1930s, Yamaha expanded its operations, first into other musical instruments, then into other products and services, such as sporting goods and furniture, and finally internationally. Export of pianos to the U.S. began in earnest about 1960. In 1973, Yamaha acquired the Everett Piano Co., in South Haven, Michigan, and made both Yamaha and Everett pianos there until 1986. In that year, the company moved its piano manufacturing to a plant in Thomaston, Georgia, where it made Yamaha consoles, studios, and some grands until 2007, when a depressed piano market and foreign competition forced it to close its doors. Since then, the company has introduced new models, made in other Yamaha factories, to replace those formerly made in Thomaston. Yamaha is probably the most international of the piano manufacturers. In addition to its factories in Japan, Yamaha has plants in Mexico, China, and Indonesia. Yamaha pianos sold in the U.S. are made in Japan, China, and Indonesia. In 2009, Yamaha closed its factories in England (with Kemble) and Taiwan. Models formerly made in those factories are now being produced in Yamaha’s other Asian plants. 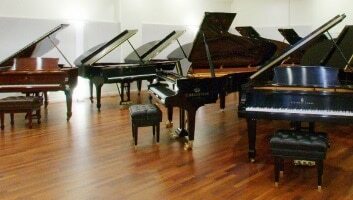 Yamaha also owns the renowned Austrian piano maker, Bösendorfer. Yamaha Pianos console line consists of the 43″ model b1, in continental style, with a laminated soundboard; and the 44″ models M460 and M560 in furniture style (freestanding legs), representing two levels of cabinet sophistication and price. All are internally similar (except for the soundboard) and have a compressed action typical of a console, which means that the action will not be quite as responsive as in larger models. The studio line consists of the popular 45″ model P22 in institutional style (legs with toe blocks) with school-friendly cabinet; the furniture-style version P660; and the 45″ model b2, with a less-expensive institutional-style cabinet. The b2 replaces the Chinese-made model T118. All studio models are internally similar, with a full-size action. All Yamaha verticals under 48″ tall are now made in the company’s Indonesian factory, which has been making pianos for more than 30 years and, according to Yamaha, adheres to the same quality standards as its Japanese plant. The uprights are the very popular 48″ model U1; the 48″ model b3, which is made in Indonesia, has the same scale design as the U1, and replaces the Chinese-made model T121SC; and the 52″ model U3. The U3 joins the YUS5 (see below) in having a “floating” soundboard — the soundboard is not completely attached to the back at the top, allowing it to vibrate a little more freely to enhance the tonal performance. A new Super U series of uprights (YUS1, YUS3, and YUS5) have different hammers and get additional tuning and voicing at the factory, including voicing by machine to create a more consistent, more mellow tone. The YUS5 has German Röslau music wire instead of Yamaha wire, also for a mellower tone. 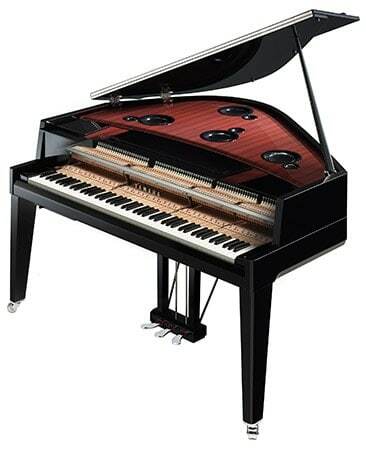 This top-of-the-line 52″ upright also has agraffes, duplex scaling, and a sostenuto pedal (all other Yamaha verticals have a practice/mute pedal). The U- and YU-series uprights are all made in Japan and come with soft-close fallboards. Yamaha verticals are very well made for mass-produced pianos. The taller uprights in particular are considered a “dream” to service by technicians, and are very much enjoyed by musicians. Sometimes the pianos can sound quite bright, though much less so now than in previous years. The current version of the model P22 school studio is said to have been redesigned to sound less bright and to have a broader spectrum of tonal color. Double-striking of the hammer in the low tenor on a soft or incomplete keystroke is a problem occasionally mentioned in regard to Yamaha verticals by those who play with an especially soft touch. This tendency is a characteristic of the action design, the trade-off being better-than-normal repetition for a vertical piano. If necessary, it’s possible that a technician can lessen this problem with careful adjustment, but at the risk of sacrificing some speed of repetition. Yamaha grands come in several levels of sophistication and size. The Classic Collection consists of the 5′ model GB1K, the 5′ 3″ model GC1M, and the 5′ 8″ model GC2. The GB1K has simplified case construction and cabinetry, no duplex scale, and the middle pedal operates a bass-sustain mechanism. It does have a soft-close fallboard. It is currently the only Yamaha grand sold in the U.S. that is made in Indonesia. The GC1M and GC2 have regular case construction, duplex scale, soft-close fallboard, and sostenuto pedal. The Conservatory Classic and Conservatory Concert Collections of C-series grands were replaced in 2012 with the CX series, consisting of the 5′ 3″ model C1X, the 5′ 8″ model C2X, the 6′ 1″ model C3X, the 6′ 7″ model C5X, the 7′ model C6X, and the 7′ 6″ model C7X. The new CX series incorporates some of the design elements of the limited-production CF series (see below) into the higher-production C-series pianos to create a sound more like that of a high-end American or European instrument — see our review in the Spring 2014 issue. Features include a European spruce soundboard crowned using CF-series technology, a thicker rim and bracing, German music wire, additional time spent voicing, regulating, and tuning by very skilled craftsmen, and some changes in cabinet design. Both the C and CX models have the advanced construction, scaling, and cabinetry mentioned earlier, including a true sostenuto pedal and a soft-close fallboard. Both also have vertically laminated bridges with maple or boxwood cap. The vertically laminated design is similar to that found in Steinways and other fine pianos, and is considered to give the bridges greater strength and resistance to cracking and better transmission of vibrational energy. All C and CX grands have keytops of Ivorite™, Yamaha’s ivory alternative. Finally, the new CF Series Concert Grand Pianos consist of the 9′ model CFX (replacing the model CFIIIS), and the 6′ 3″ model CF4 and 7′ model CF6 (respectively replacing, in the U.S., the models S4B and S6B, which will remain available by special order only). The pianos in this collection are made in a separate factory to much higher standards and with some different materials: e.g., maple and mahogany in the rim, which is made more rigid, for greater tonal power, than in the other collections; higher-grade soundboard material; a treble “bell” (as in the larger Steinways) to enhance treble tone; German strings, and hammer and scaling changes, for a more mellow tone; as well as the more advanced features of the other collections. The result is an instrument capable of greater dynamic range, tonal color, and sustain than the regular Yamahas. The new CF-series pianos have a thicker rim and more substantial structure than their predecessors, for greater strength and tonal projection, and the method for developing the soundboard crown has been changed to allow the soundboard to vibrate more freely and with greater resonance. The models CF4 and CF6 have an open pinblock design reminiscent of some European pianos, which gives the tuner slightly greater control over the tuning pins. Yamaha says that the CF series represents 19 years of research and development by its craftsmen, designers, and engineers. 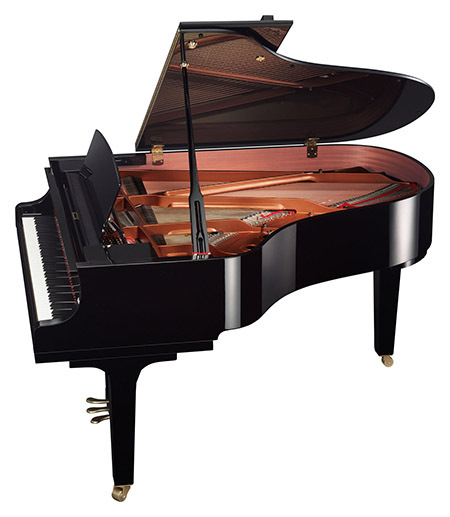 The Yamaha concert grand is endorsed and used by a number of notable musicians, including Olga Kern, Michael Tilson Thomas, Chick Corea, and Elton John. Other than the special grands just described, Yamaha grands have historically been a little on the percussive side and have been said not to “sing” as well as some more expensive pianos. The tone has been very clear and often bright, especially in the smaller grands, although the excessive brightness that once characterized Yamahas seems to be a thing of the past. The clarity and percussiveness are very attractive, but are sometimes said to be less well suited for classical music, which tends to require a singing tone and lush harmonic color. On the other hand, Yamaha is the piano of choice for jazz and popular music, which may value clarity and brightness more than the other qualities mentioned. More recently, however, Yamaha has been trying to move away from this image of a “bright” piano whose sound is limited to jazz. First with its larger grands, and more recently with the smaller ones, Yamaha has changed the bridge construction and hammer density, and provided more custom voicing at the factory, to bring out a broader spectrum of tonal color. 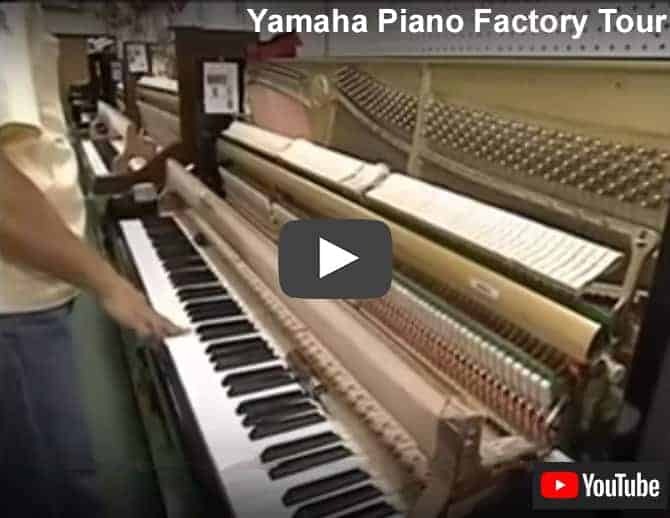 Both Yamaha’s quality control and its warranty and technical service are legendary in the piano business. They are the standard against which every other company is measured. For general home and school use, piano technicians probably recommend Yamaha pianos more often than any other brand. Their precision, reliability, and performance make them a very good value for a consumer product. Until recently, Yamaha made an entry-level line of pianos under the name Cable-Nelson. This is the name of an old American piano maker whose roots can be traced back to 1903. Yamaha acquired the name when it bought the Everett Piano Company, in 1973, and used the name in conjunction with Everett pianos until 1981. The most recent Cable-Nelson models were made in Yamaha’s factories in China and Indonesia. There is a thriving market for used Yamahas. If you’re considering buying a used Yamaha, please read “Should I Buy a Used, ‘Gray Market’ Yamaha or Kawai Piano?” on pages 176–177 of The Piano Book, and “Buying a Used or Restored Piano” in this publication. 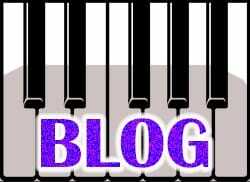 This content is credited to the Piano Buyer and can be found in its original form on their website.